Looking for something CREEPY... SPOOKY... KOOKY... and altogether OOKY? Come join The Addams Family for the most hilarious scarefest of this season or any other! When long-lost Uncle Fester (Christopher Lloyd) reappears after twenty-five years in the Bermuda Triangle, Gomez (Raul Julia) and Morticia (Anjelica Huston) plan a celebration to wake the dead. But Wednesday (Christina Ricci) barely has time to warm up her electric chair before Thing points out Fester's uncommonly "normal" behavior. Could this Fester be a fake, part of an evil scheme to raid the Addams fortune? Based on Charles Addams' beloved cartoons and following the success of the hit TV series, The Addams Family is a visual funhouse, packed with plenty of treats, tricks and turns by director Barry Sonnenfeld. Decided to watch this one today because I felt like something lighthearted and silly... plus I haven't seen it in years, as I just got the disc yesterday. And this film definitely fits the bill as silly fun. A lot of films based on old TV Series tends to just disappoint. But I think this one did a good job. It does a decent job at staying true to the series. And just plain fun to watch. While the cast all seemed to do a pretty good job... for me the stand-outs were Christopher Lloyd as Fester and Christina Ricci as Wednesday. Anyway... think it is worth checking out if you liked the series. One of the most eagerly-awaited genre films of the 80's finally arrives on Blu-Ray™! When an alien experiment goes awry, it crashes to Earth in 1959 and infects a young college student. Twenty-seven years later, his cryogenically frozen body is thawed out by fraternity pledges...and the campus is quickly overrun by alien creatures — whose victims come back as zombies! Fred Dekker's enjoyable throwback chiller deftly mixes all sorts of genres while simultaneously having fun with them (the college and all the leading characters are named after famous horror movie directors). This jam-packed release contains the ending Dekker always intended. As an added bonus, the original theatrical ending is also included. So reach out and grab this treat for all fans of scary movies, then fire up the Blu-Ray™ player and yell, "Thrill Me!" You may remember I watched this one just a few months back. But this is one of my favorite classic '80s horror films. This is one I can see watching every year for my October horror marathon. I so enjoyed watching this film again! The characters are a lot of fun. Story keeps your interest from beginning to end. And the make-up effects are good too. And what I like about this blu-ray release... it has both the director's cut ending as well as the theatrical release ending... which kept the ending open to a possible sequel. I highly recommend adding this one to your collection! After the barn, there is much conflict among both groups of survivors, Hershel wants Rick and his group to leave immediately and Shane accuses Rick to be just as delusional as Hershel saying that Hershel knew about Sophia the whole time and hid her from the group. Dale tells Andrea to be careful about her relationship with Shane since Dale knows what kind of person Shane is and now wants him gone from the group. He also reveals this to Lori, including the fate of Otis. I finished off the second disc of season 2. And once again I must say I really enjoyed all these episodes. Even after multiple viewings I find learning the fate of Sofia is still a powerful moment. Highly recommend this series to everyone. So looking forward to season 4 starting tonight. "The suspence is killer!" raves Peter Travers of Rolling Stone in this fast-paced, pulse-pounding action epic. Former United Nations investigator Gerry Lane (Brad Pitt) is in a race against time to save both his family and the world from a pandemic that is toppling governments and threatening to destroy humanity itself. David Denby of The New Yorker calls World War Z "the most gratifying action spectacle in years!" When I saw so many good reviews for this one I knew I had to check it out. Though I did have reservations going into it. First it stars Brad Pitt and I never been much of a fan of his. Also my brother didn't care for it... and we do have similar tastes at times. Thankfully this is one time I didn't agree with him. Surprising I even enjoyed Brad Pitt in this one. I also like how they handled the fast zombies vs. slow zombies in this one. And finally I like how they handled the ending of the film. They obviously was trying hard to get the PG-13 rating. The one complaint I have here is there is extremely little... if any type of gore here. It seemed like they didn't even want to show much any blood. And that seems kinda weird when thinking of a zombie movie. But over all... I liked this one very much.... definitely recommended. I believe the unrated version has a little more gore; it was cut out originally as they wanted the PG-13 to optimize takes at the box-office. Any ideas?... I know... too obvious. This is one of the first Anthology movies I ever seen... and one of my favorites. In my opinion a real horror classic! 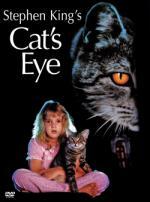 I loved how the cat in the beginning of the movie is shown running past other Stephen King greats... like.. seeing the cat getting scared by Cujo coming out from behind a fence and almost getting run over by Christine. At one point they also show a couple of the characters watching The Dead Zone on TV. This Anthology had 3 stories to it... and in this case I really enjoyed all 3 of them. I definitely recommend this one. This is an episode I watched on Youtube. You know... 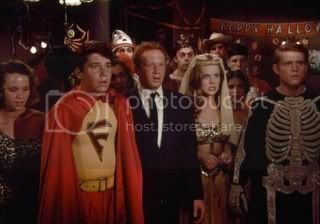 I thought I seen every episode of Happy Days a hundred times... which is why I never bothered with the DVDs. But somehow this episode I don't remember ever seeing. Not sure how this is so... must have very seldomly aired on TV for some reason. Anyway... I found it to be a lot of fun to watch... and strange seeing one I don't basically remember every line of. Packed with even more intense thrills than audiences experienced in theaters, this unrated version of Wes Craven's Cursed brings you the terror of werewolves as never before! Christina Ricci (Monster), Jesse Eisenberg (The Village), Joshua Jackson (TV's Dawson's Creek), Judy Greer (The Village), and Milo Ventimiglia (TV's Gilmore Girls) find themselves caught up in an unimaginable horror! A werewolf loose in Los Angeles changes the lives of three young adults who, after being mauled by the beast, learn that the only way to break the curse put upon them is to kill the one who started it all! From the creators of Scream, this never-before-seen version is shockingly more frightening and undeniably more fun than the original release! I watched this one before bed last night. I seen this one a couple times before. I definitely wouldn't say this is the best Werewolf movie I ever seen... but I did enjoy it. I don't know what the theatrical version was like... but this one has a nice amount of gore in it. On my first viewing I didn't care too much for the whole werewolf dog thing... but that scene has since grown on me. Over-all a good movie... worth the time put in to watch it. This is a TV movie from back in the '70s. Remembering back to when I worked at our local video store... this movie was in great demand. Unfortunately at the time I never got to see it myself as the store's copy disappeared and none of our distributors at the time could locate a new copy for us (this is back in the VHS days). So the first time I got to see this movie was when I first got it on DVD back in 2007. And I must say I enjoyed it very much! The first story,Julie, Karen Black plays a College Professor who gets seduced and blackmailed (as the cover says). I liked how the student didn't have as much control over things as he thought he did. An enjoyable segment... but not my favorite. The DVD itself While good I am a little disappointed. The audio and video is just fine. But I have a bit of a hard time with them calling this a special edition. All there is... is 2 featurettes and a commentary track. That seems to me a little slim to be calling it a special edition. But with that all said... I really enjoyed watching this movie again. Infuriated over an interview where Paul mocks witchcraft, Cassandra, an all-powerful sorceress, sends a mischivious eight-year-old "Hit Witch" to exact her revenge. This is a fun episode to the (apparently) little known Bewitched spin-off series. In this series Lisa Hartman plays a grown-up Tabitha Stephens. The show does a pretty good job at updating the series. Unfortunately the show only lasted 12 episodes before it was canceled. One thing that I do believe they changed from Bewitched... they made Tabitha's brother Adam mortal. If I remember right in Bewitched he did have powers too. But maybe my memory is off on that. Jobless after having her medical license revoked, Dr. Alice Dodgson (Jennifer Grey, Dirty Dancing) accepts an offer to travel to Jamaica and treat American Paul Claybourne's (Craig Sheffer, A River Runs Through It) mysteriously ailing brother. But immediately upon her arrival, Alice finds herself immersed in the exotic rhythm and harmony of this foreign civilization...and besieged by the locals with terrifying tales of zombies and demonic possession. As her long-held faith in science clashes with her new experiences in the supernatural, Alice must ultimately submit to the strange native culture to save her patient, while fighting to escape with her own life. Also starring Tim Curry (Kinsey). This is the first time I ever seen this one. Matter of fact... until recently I didn't even know that Tales from the Crypt did a third film. Now if I am not mistaken I have everything done by them. I never been a big fan of films about voodoo... but this one was pretty good. Over-all I enjoyed it... even though I seen the ending coming from a mile away. Worth the time put in to watch it... but don't go in expecting too much. The Blu-ray disc has no extras what so ever... but this isn't surprising what with it coming from Echo Bridge. I decided to pop this one in today. Been years since I seen it. It is a fun continuation... I did enjoy it. But not quite as much as I did the first part. In this one Carol Kane took over the role of Granny... which was cool... I liked her in the role. This is worth watching if you liked the first one. It's really cheap at Amazon, so I might complete the "trilogy" at some point. After moving to Sunnydale, California, Buffy Anne Summers just wants to be a normal teenager. Back in Los Angles her first Watcher had died, she inadvertenly burned down the school gymnasium at her old high school and her parents got a divorce. The move to Sunnydale is supposed to give both her and her mother, Joyce, a clean slate. But then she meets the school librarian, Rupert Giles, and quickly learns there is no escaping her destiny. The urge hit me and I found myself watching the first season. Well it has been about a year since I last watched the series. I don't know if I will watch the entire series again.. but I do still have the urge to watch so will at least start season 2. This first season... albeit short... contains a lot of very good episodes. The first season easily hooks you and keeps you wanting more. Definitely a series i recommend... if you somehow have never seen it.